These look so smooth and peanut butter-y. 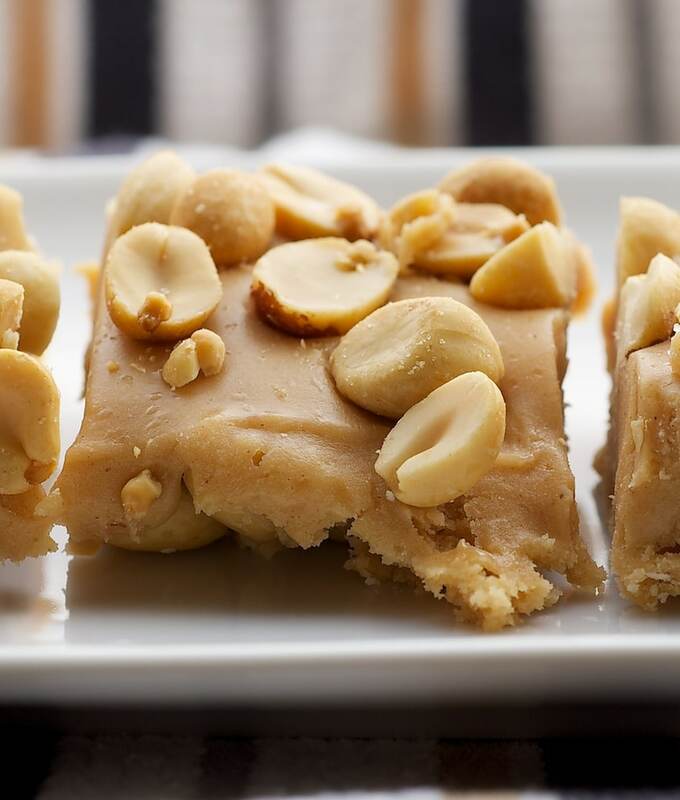 I love peanut butter desserts because they aren’t too sweet- they have that nice saltiness too! I think these would ship well. Hint, hint. Will definitely try these! They sound good…and easy! 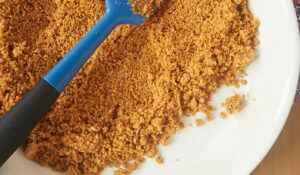 I love to combine sweet and salty things, the best is that they only need 5 ingredients, I want to make them! 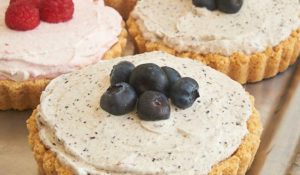 This looks both easy and super delicious with no effort – cant wait to try it and add it to my baking blog!!! 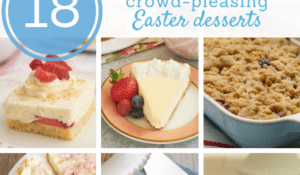 Yum — those look so easy…I think I might complicate them a little and add a layer of melted chocolate. Can’t wait to try them! Lucy, it is only due to a huge amount of restraint on my behalf that I didn’t do exactly that. I have some leftovers, so it may happen yet! Wow, these look amazing! I am pretty sure I would eat the whole pan by myself. Unless my husband beat me to it! Tom, I’m not sure I could take all of that at the same time! Those could be dangerous. Jennifer it was so nice to meet you at the cookie swap! Your blog is beautiful. I love the photos, and your story. Let’s stay in touch and be baking buddies! 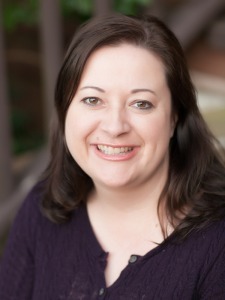 Lynda, it was great to meet you, too! Happy holidays! These make me think of Payday bars. Making these asap. Thanks for sharing the recipe! I love how simple these are. I make these for Christmas every year! They are my top requested sweet but they are so so easy to make. And yes, taste like a Payday! So… I cannot read today. I saw these and immediately knew I’d fall in love. I got into car. Went to store for ingredients. Came home with peanut butter NOT peanut butter chips. Decided not to go back to store. Made with 1 cup peanut butter instead of chips. Used smaller pan. Fell in love. Delicious! Incredible! Was devastated because I’ve never heard of peanut butter chips (Australia) so gad to know I can use peanut butter! Trying these! Do you think these can be shipped? My son is in the army and I’m always looking for treats that can be mailed. Lori, I think they’d ship well enough. I bet these could be dropped on wax paper for individual pieces – like you do no bake chocolate oatmeal cookies/candy. Can’t wait to try these. Thanks Elyse for mentioning using 1 cup peanut butter instead of the chips. I have peanut butter in the pantry – not the chips. Help! 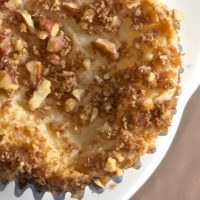 I tried these and they taste WONDERFUL, but they are sooooo gooey and sticky I could hardly get them out of the pan. I couldn’t possibly get them to look as neat as in the picture. What did I do wrong????? Deb, did you do anything differently at all from the recipe? I made these and they are so easy and SO DELISH. Can I freeze these for a week or two? Linda, I think they would freeze well. I can’t pull up the ingredients?! What’s the recipe? Made these today, but I am a little confused. I followed the recipe but had to add in some peanut butter as I didn’t get the right amount of chips. Are the marshmallows supposes to melt? Because mine didn’t. The mixture was getting too tough to stir. I’m not a baker, but I decided to make these and save some money instead of buying real candy bars. Also, since I am a fan of Baby Ruth’s I put a drizzle of chocolate on half of the bars. Yummy!! Britton, the marshmallows should melt when you add them to the hot butter/peanut butter mixture. The mixture should be smooth after it’s all mixed together. The recipe indicates an 11×7 pan… I’m assuming this is supposed to be 11×17? Hosting a baby shower soon and I think we’ll have these! Tina, it’s 11″ x 7″. There’s a note at the bottom of the recipe for using 9″ x 13″ if you need to make more. I made these today after salivating over the recipe for a couple of days now. I found this recipe on Pinterest. Mine are not currently fully chilled, but I am skeptical if they will chill fully and set due to the near 100% humidity. Also, I found that with my improvised double boiler my mixture was not hot enough to melt my marshmallows and had to put it back on the heat for it bit more to stir it in. All did melt with persistance and the sample I tried a bit ago was wonderful! I can’t wait to have more tomorrow! Thanks for sharing this recipe! Oh no. You can’t get Paydays in England, so I always bring some home or request them from the states. The only reason they don’t have to cut me out of the house and carry me away on a tractor is I can’t eat Paydays all the time. Now I can, I’m about to triple in size. I was so excited to make these, but mine didn’t turn out either :(. The marshmallows would not melt at all! After I added the condensed milk, the mixture was way too cool to melt the marshmallows. Perhaps if I had added the marshmallows first? I tried putting it back on the stove to melt the marshmallows, which only made the mixture super thick and impossible to spread. Maybe next time I’ll add the marshmallows when the peanut butter chips and butter are halfway melted, or try marshmallow fluff instead. Hopefully they still taste ok! Laura, did you use miniature marshmallows? They’ll melt faster than regular-sized marshmallows. Also had trouble getting the marshmallows to melt. Added a bit more butter to thin it out and put back on the stove for a bit. It was very thick but I managed to spread it with a little work. Thinking about using marshmallow fluff next time. Delicious so far! are these like payday candy bar? Terry, the flavor is similar. I made these today I used marshmallow cream because I had no marshmallows they are cooling now! From what i already tasted these are gonna be great! Thanks for the recipe! These totally rock, made them for family reunion and everyone wanted the recipe….thanks! I made these with halal marshmallows (woohoo, perks of living in Toronto) but mine didn’t work either. Tastes great but it’s just a gooey mess, not bar like at all. My marshmallows didn’t fully melt. Trying to figure out how I can SAVE these goodies. Help!!! Should I pop it into the microwave? Double boiler the mixture and repress into tray with parchment paper lining? Ideas, anyone? Hi, Nazerah. I’ve never used halal marshmallows, so I don’t know how/if they differ. It’s important for the marshmallows to be the mini size, and you must work quickly when stirring them so that they’ll melt well. You could try reheating over very low heat. made them and had to keep cooking over low heat to get the marshmallows to melt. they seem really soft and Im afraid they will not set up. how long should you let them chill? Michelle, they’ll likely need to chill for a few hours. You can even leave them overnight. I’m wondering, since everyone seems to be having trouble with their marshmallows melting, could you add the butter and condensed milk first in the pan, then add the marshmallows until they begin to melt, then add the peanut butter chips as other ingredients? Hi, Trudy. I’ve only ever made them as written, and I’ve not had trouble getting the marshmallows to melt. I think the peanut butter chips need to get melted first, as they would be tougher to melt than the marshmallows. If the marshmallows aren’t melting, you can always put the pan back on low heat for a brief time to get things melting. I am excited about trying these out. Do you have a subistitue for the peanut butter chips? Like how much peanut butter instead? Also how do I follow your great blog? Mine didn’t set up either. 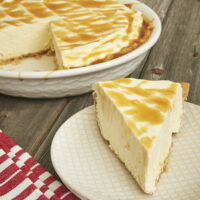 Tasty but too gooey to cut. Popped them in the freezer to see if I can cut them. 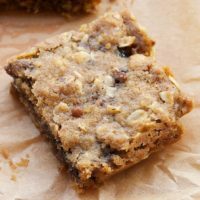 I made these last week and they didn’t harden enough either – turned out a gooey sticky mess – even after freezing. Tasted great but had to throw them out without eating all of them…maybe too much condensed milk, not enough marshmallow?? They would have been great otherwise. Followed the recipe. 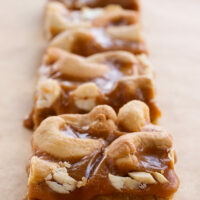 I Love Payday candybars and when I seen this receipe I had to try it. I decieded to adjust the receipe by adding 1/2c.Jiff pnut butter and only using 10 oz bag of reese pnut butter chips. I melted all ingredients together over the heat except the condensed milk I added last . I also added some marshmallows to the top. Texture seemed really smooth and not gooey…hopefully they set ……………..
Just made these and put in the fridge to chill. My marshmallows (yes they were miniature) would not melt either. I put the pan back on low heat and kept adding butter until they finally melted and the mixture became smooth. I ending up adding almost an additional 2 tbsp butter. Fingers are crossed that they cool and setup because they sure do look yummy! Just put mine in the fridge to chill and hopefully set! I did get the marshmallows to melt, and I evn used the reg ones because thye dont have the minis in Germany, and used peanut butter instead if chips, same reason! Hope these turn out! Recipe did NOT set up. 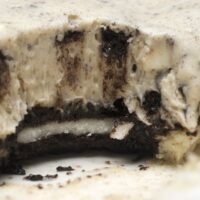 Too gooey. Just a tasty mess. These didnt set up enuf to cut even after refridgerating. The next day they were just firm enuf to cut. But were really good! Just made these, and they were perfect!!! After reading the reviews, about the marshmallows not melting. I discovered while melting the butter and peanut butter chips, that it doesnt really get hot enough, so after they are melted turn the heat up just a little more, make sure you keep stirring, just till it feels hot to the touch. Along with that, I put the sweetened condensed milk in a small saucepan, and let it set on low heat just till its warm/hot, then add all ingredients to the peanut mixture. Just keep stirring with a spoon, kind of squishing the marshmallows, and they will melt in. I am a payday’s biggest fan, and these are absolutely yummy!!! Thank you Jennifer for this delectable recipe! Are the marshmellows supposed to melt? Yes, Christy. It’s a lot like melting marshmallows for making Rice Krispies treats. Make sure the mixture is hot enough to melt the marshmallows. If not, then return it to the heat for a few minutes. 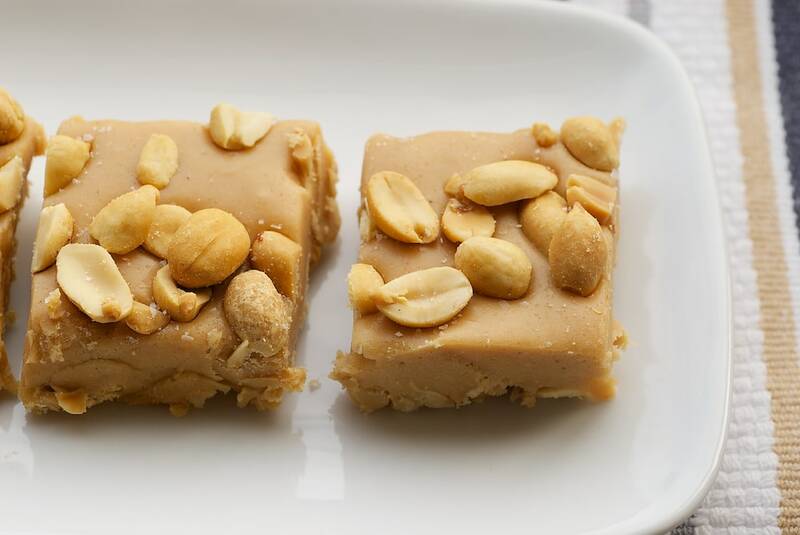 Another easy no bake peanut butter goodie – take equal amounts – like a l/2 cup of: peanut butter, honey, dry powdered milk (or we’re experimenting successfully with protein powder), and oatmeal. Then add mini choc chips as you like.. Mix and have kids make into small balls; refrig and viola! They are GOOD! mine did not set up either…but think I will scoop it out into little muffin tins and serve that way. I made this recipe strictly as written yesterday and they were delicious! I cut them into fairly small rectangles and wrapped them in waxed paper to make them feel more like candy. Then I made some more today, but didn’t have the right volume of peanut butter chips, so used 1 cup peanut butter chips and 1 cup chocolate chips. Yum! I hope to have some left to wrap up…. I couldn’t get the marshmallows melt, either. I just transferred everything to a glass pan and put it in the microwave for a few minutes, stopping to stir after each minute until the marshmallows incorporated into the mixture. When hot, it spreads easily over the nuts. Before I did that, it was sooo hard to stir and was setting up in the pan. I had to put it back on the burner to get the marshmallows to melt. 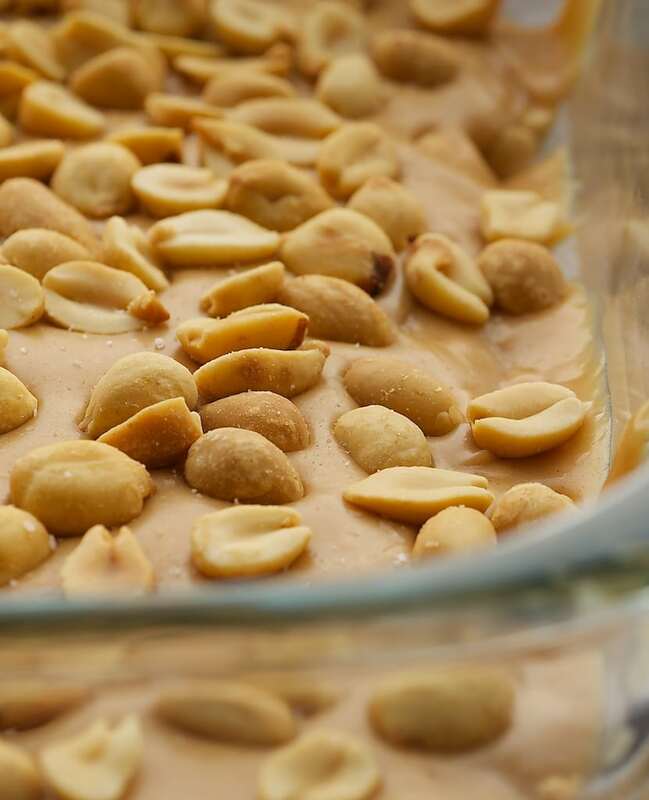 I used the larger pan method with the extra peanuts and was able to pour the mixture over the peanuts with no problem. After I cut them and take them out of the pan the peanuts fall off. Will try dry roasted next time, maybe they will stick better. Everyone thought it was great candy. I just tried to make these and they are really sticky or soft. Did I do something g wrong? Or maybe not let them set long enough? I put in the refrigerator for 3 hours. syntitha, maybe they need to refrigerate longer, although they should be somewhat soft. Did you make any changes to the recipe? I made these today.. super yummy… i also had the marshmallow melting problem but i was able to salvage it really quick by whipping out my hand mixer and giving it a whirl.. melted and mixed it up really nicely though i did make a mess lol.. this is a delicious recipe and im definitely going to make them again.. They are in the fridge, can’t wait to taste them. Can’t wait to try! I love simple no fuss recipes like this, means I will probably make once a week 🙂 Are the marshmellows optional? Amy, you’ll need the marshmallows. What a disappointment. Made a double batch, one for family and one for a gathering. They won’t set and are just a gooey mess. And yes, I followed directions. I have made 5 batches of these. I really love the flavor but I have trouble as well getting the marshmallows to melt. Also after several hours in the refrigerator they do harden to where they can be cut into bars but they don’t stay that way for long. They start to get sticky fast. Have followed the recipe completely. What am I doing wrong or what can I do to correct this? Since so many had trouble with their marshmallows melting, I shall heat my milk before adding to the mixture. Hi, Renna! Roasted peanuts should work just fine. They’ll just taste a bit different. My melted butter/chip mixture also wasn’t conducive to mixing in or melting the marshmellows easily, so I just put the whole thing back on the stove top on low and stirred until everything was blended. 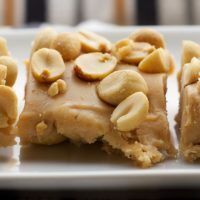 I poured into my pan of peanuts, but worked as fast as I could because the mixture hardened quickly and I wanted to even out and get nuts to stick on the top. Final result is VERY sweet but tasty. Not super easy to cut cleanly and the nuts fall off. I was planning to add to cookie trays for gifts, but realize now this isn’t the best recipe for that since they are supposed to store chilled. Oh well. I’ll try something else! My husband and I just finished this delightful recipe… This was fun to make and easy, make sure you have some muscle power!!!! tasting the mixture was yummmmmolicious too!!!!! Hey My mellows melted perfectly, doesnt the recipe say to melt the butter and chips, then add the sweet cond milk, with hot sweet cond milk how could mellows NOT melt.. ANYWAY mine set up great and all was good cept the peanuts WONT STAY ON! The all fall off as soon as I cut them or touch them? Did I heat the mixture too much you think? nykee, you could try gently (and carefully) pressing the peanuts into the bars while they’re still warm. 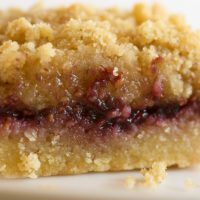 I made these bars twice, the first time I followed the recipe exactly and they were too soft. The second time I used half the amount of condensed milk and they were perfect, the can was 14 ounces, so maybe some stores carry a smaller size, the recipe was very vague. Hope this helps! Hi, Peggy. They should keep in an airtight container at room temperature for 3 or 4 days. Really professional looking photography, makes me sooo hungry! I love these!!! would you mind creating a recipe with almonds and no peanut butter flavor? Would butterscotch chips work the same way? Thanks!!! Thanks, Marion. I think butterscotch chips are worth a shot! Good quality ones should melt well.